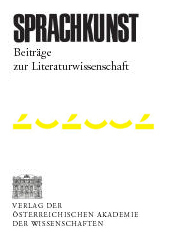 Sprachkunst is an Austrian periodical for literary studies. As an international forum for the publication of articles on literary history and poetics it also includes critical discussions and scholarly reviews; in addition, literary dissertations and Habilitationsschriften at Austrian uni ver si ties are annually listed in summarised form. The accepted languages for publication are German, English, French or Russian. Sprachkunst endeavours to mediate between different literatures and schools of research.